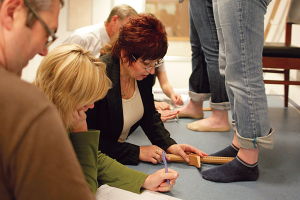 Custom-designed and fabricated orthotics can take the pain away from common foot conditions. Here at The Active Foot Store, we do everything in our power to make sure that each customer has access to the orthotic resources they need to take control of their foot health. Whether you’re suffering from plantar fasciitis, bunions, hammertoes, diabetes, or any other type of condition that affects your feet, we can craft special, tailor-made orthotics that will give your feet the pampering they deserve. Today it seems that everyone claims to be an expert in fabricating orthotics. Don’t be fooled! We are the only retail facility in San Diego County that has the expertise to make a medical-grade custom orthotic. We are the only facility to have both a Medical Director and a Certified Pedorthist. We offer the best device at the best price anywhere in the country. At our location in La Jolla, our team of specialists will take a careful look at your feet and listen dutifully to your concerns. Sit down for a consultation to get started with your very own pair of medical-grade custom orthotics. Customers from San Diego County and beyond visit our University City store to learn more about how medical-grade, custom-fabricated orthotics can change their lives. When you pay us a visit, our team of highly trained orthotic specialists will get to the bottom of what’s going on with your feet. This initial meeting usually takes less than half an hour, and when it’s over, we’ll have a solid idea of how to proceed to improve your foot, ankle, knee, and back comfort. We’ll take an accurate impression of your foot and use advanced CAD technology to develop an orthotic that’s right for you. Every foot evaluation is overseen by our Medical Director, Dr. Reingold, so you know you’re in good hands. Here at our store in San Diego County, we don’t just craft new orthotics. We also repair old or worn-down orthotics that can easily be revived with the right touch. It’s a good idea to have your orthotics refurbished on a regular basis, and we can breathe new life into orthotics that you might otherwise have chosen to throw away. We can usually repair your orthotics within a few days, and you’ll be able to save a lot of money by having your old orthotics checked out and refurbished. In many cases, our rapid repair service can add years of life to quality orthotics that were just about to kick the bucket. Even if your orthotics appear to be in good shape, you should still have them looked at regularly to make sure that no faults have developed that only a professional can detect. Contact us today to take advantage of our orthotic expertise.